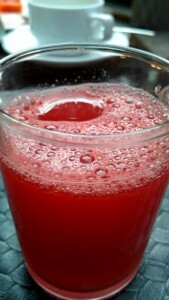 Cut apple and watermelon to fit juicer, then juice. Cut lime in half and squeeze limes into the juice. Enjoy plain or over ice. Using a medium to tart apple (e.g., Braeburn, Honey Crisp, Granny Smith) if you have sweet watermelon. Removing the watermelon rind before juicing, especially if watermelon is not organic. Adding enough watermelon to yield at least 24 oz of juice and a good flavor profile.